With regard to teaching strategies and the teaching environment, continuous optimization and innovation are essential if we are to meet future demands in a rapidly changing global society. 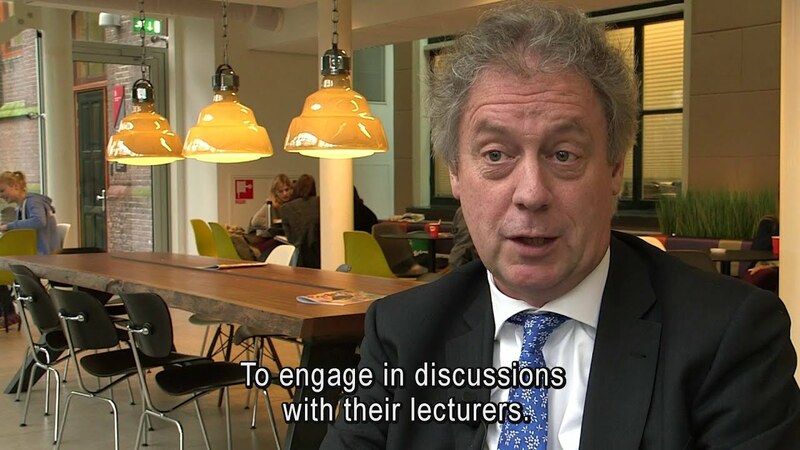 Building on its long tradition of high quality education and pioneering innovation, the University of Groningen has therefore revolutionized its teaching in recent years. We have successfully piloted state-of-the-art educational concepts such as research-driven education, communities of learners, the international classroom and e-learning, and these are now being implemented. This has significantly improved study results and increased student satisfaction. We strive to develop the full potential of young people so that they can shape the world of tomorrow as independent and responsible members of society, who think critically, function at an academic level and apply knowledge in a meaningful way. In order to achieve this, our educational vision focuses on establishing strong links between students and staff, between teaching and research and between teaching and relevant social issues in national and international contexts. We believe that talent and potential flourish most in a close-knit academic community that imparts, generates, exchanges and integrates knowledge, a community that inspires its members to develop their academic knowledge, interests and talents to the full. As this is an international university, it requires an international educational programme and an academic and social environment in which cultural differences between staff and students serve as an opportunity to learn from each other. This enables staff and students to develop their full potential, collaborate in a committed and respectful way and make a responsible contribution to academia and society. Our vision of teaching and learning rests on the assumption that the acquisition of knowledge and skills is primarily the result of optimal interaction between staff and students that enables students to become active and responsible participants in their own learning process. Our educational strategy focuses on prompting students to become respected participants in our academic community. Learning is therefore an activity that takes place in context, as an interplay between lecturer and student that focuses on learning to know, learning to do, learning to live together and learning to be.3 Inspired guidance familiarizes students with the shared knowledge base of their discipline, so that they build on and extend the knowledge gleaned from their own experiences, perspectives and backgrounds. Our aim is to impart to students the values, skills and knowledge that they need in order to become the next generation of independent and responsible leaders, innovators, academics and professionals around the world who can also think critically. In order to accomplish this, we teach them in a challenging environment that focuses on personal development and ambition as well as creativity, entrepreneurial spirit and a mutual commitment to excellence. It is inspired by leading current research, highly motivated lecturers and relevant social issues in national and international contexts. In order to create the intended environment and community we will set high standards for both our students and ourselves, and will subsequently reward not only excellent students but also excellent staff. Our staff and students will be encouraged to develop and evaluate innovative forms of teaching such as e-learning and the flipped classroom in order to ensure we stay up to date. Our faculties, departments and lecturers will be encouraged to work together for the benefit of our students and to develop coherent, effective and interdisciplinary methods of course unit delivery. Moreover, we will continue to strengthen our academic community by using learning communities throughout the University. Our teaching will be research-driven at both Bachelor’s and Master’s levels to ensure that students become a real part of our academic community while at the same time being introduced to the forefront of science and technology. We will continue to focus on our research strengths and priorities in our Master’s programmes in particular. Our graduates will thus be highly sought-after specialists in their chosen areas of expertise and able to help solve the societal issues of today and tomorrow. The continuing diversity of our academic population is warmly welcomed. We will provide an international perspective by applying the international classroom concept, which introduces students to diverse perspectives and uses international examples to illustrate topics. The introduction of one or more international branch campuses, and to expand and intensify on our present international partnerships, will further internationalize and strengthen our academic community. In order to equip students with the competences they need, we will identify the employability and entrepreneurial skills that are inherent to our degree programmes. We will also optimize our career services to make us better able to help students to sharpen their career building skills and find a suitable job. Last modified: 19 July 2018 10.07 a.m.